A person with Alport Syndrome might have to look far and wide to find somebody else who can truly understand his symptoms. Just 1 in 50,000 newborns is born with this debilitating genetic disease, which shuts down kidney function and causes hearing and vision loss. Though the syndrome has been understood, at least at a rudimentary level, for decades, it can still take years for affected individuals to get a correct diagnosis. There are thousands of rare diseases with stories just like Alport Syndrome; while individually they struggle to get widespread attention, today is a day to remember all of them. Since 2008, February 28 has marked Rare Disease Day — a time to recognize people around the world suffering from these hard-to-diagnose, primarily genetic, often incurable diseases. Rare Disease Day is celebrated in countries around the world; more than 70 participated last year, and it is expected that even more will take part in 2014. Indeed, while so much public and private funding goes toward common diseases such as cancer, it is worth noting that in aggregate, the burden of rare disease is also high: it is likely that hundreds of millions of people around the world have a rare disease. While one rare disease may affect only a handful of patients, others may affect thousands – in the EU alone, as many as 30 million people may be affected by any one of over 6,000 known rare diseases. Teasing out the genetic basis of these diseases requires exome or whole genome sequencing studies — and while clinics are now using the technology to help severely affected individuals already, where underlying genetic variation is especially complex, some of those studies will need thousands of people to have enough statistical power for finding causal mutations. These efforts could get a much-needed boost as scientists compile high-quality sequence data across thousands of subjects and then share it with other groups for additional data mining, use as healthy controls, and more. The spirit of collaboration that has been so strong in genomics will be of tremendous benefit to the scientists and clinicians seeking to understand and ultimately prevent or cure rare diseases. Efforts like that of the Global Alliance, which aims to develop technology standards around securely sharing genomic and clinical data, will go a long way toward filling in the puzzle. Here at DNAnexus, we support any endeavor to improve health outcomes for people with rare diseases by streamlining access to genomic data, analytical tools, and computational resources. We hope that our platform will be helpful in moving some of these scientific and clinical efforts forward. In addition to honoring those people struggling with rare diseases, today we celebrate the scientists, clinicians, and medical geneticists around the world who are working hard to alleviate these conditions. Our best wishes to all of you from everyone here at DNAnexus! 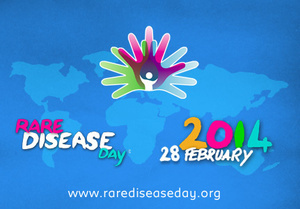 Click here to find out more about Rare Disease Day and add your support.